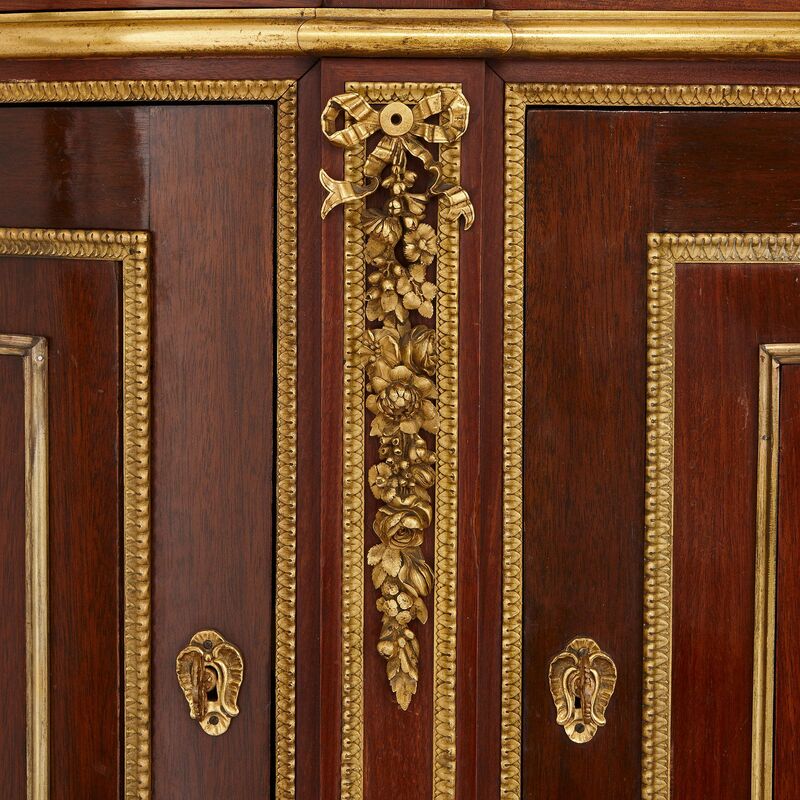 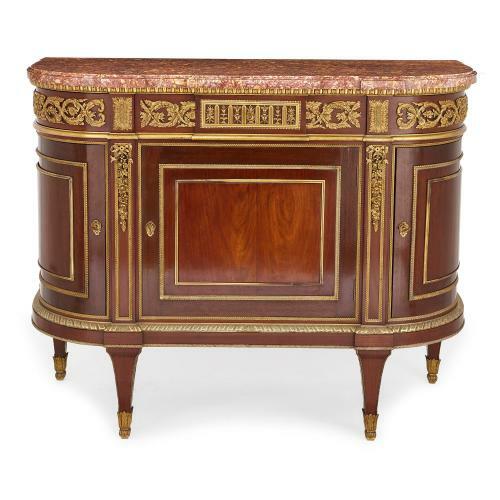 This beautiful curved cabinet, featuring exceptional ormolu mounts, and is a fine example of the work of the master French cabinetmaker, Henry Dasson. 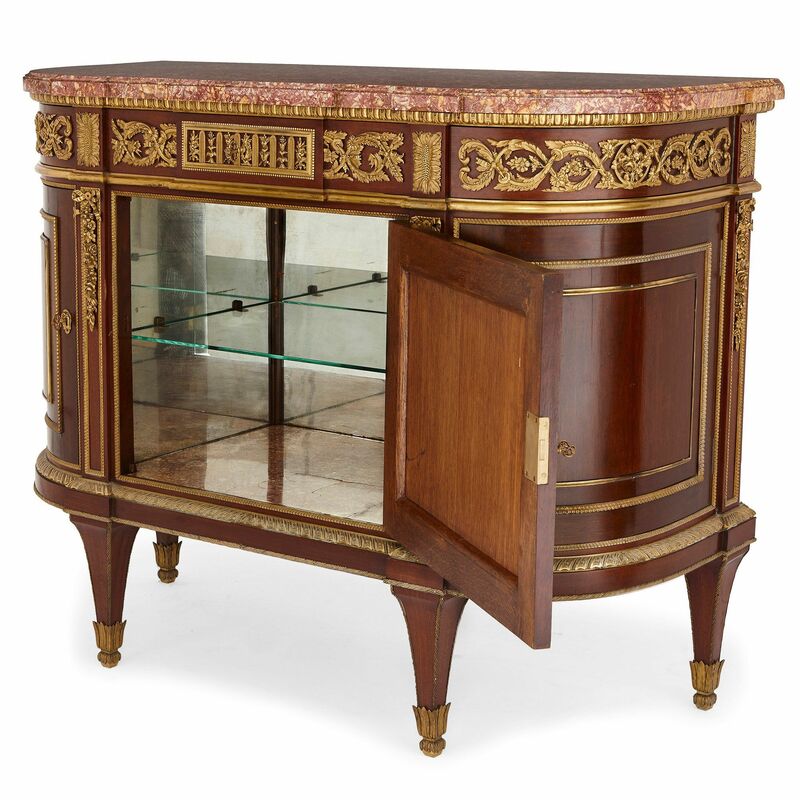 Famed cabinetmaker Henry Dasson (1825-1896) was one of the most highly skilled craftsmen working in Paris at the end of the 19th Century, and this cabinet is a splendid example of the fine quality of Dasson's wondrous creations. 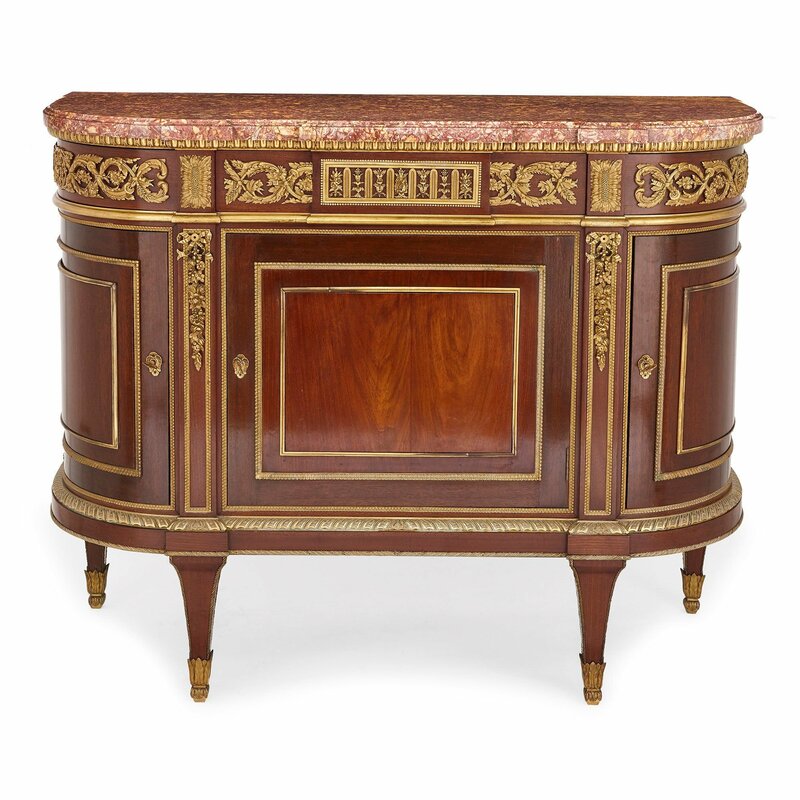 With a beautiful veined red marble top, shaped to follow the curves of the cabinet, this item is a highly desirable item of luxury furniture. 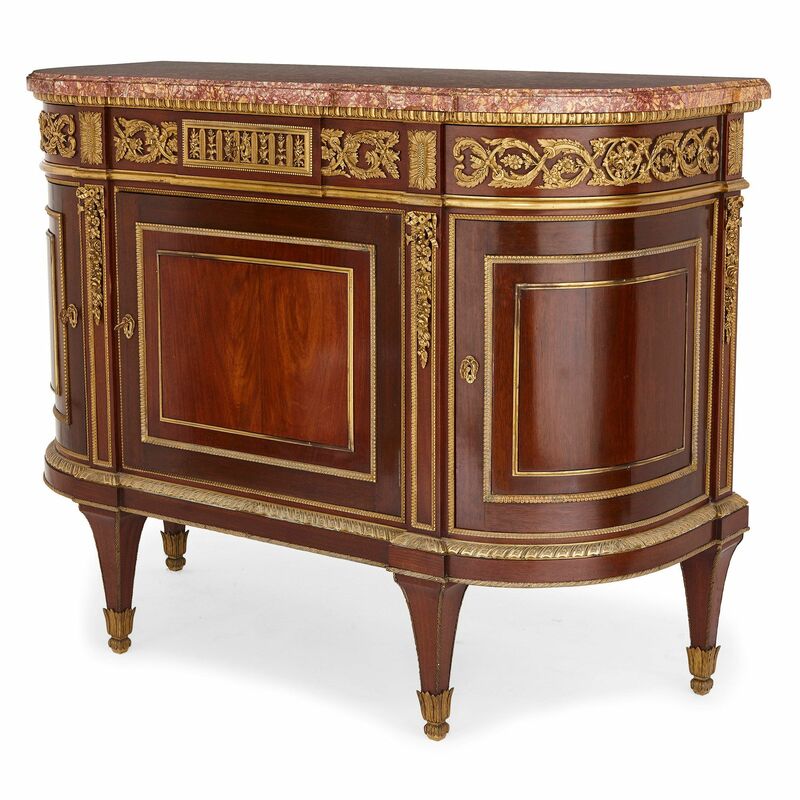 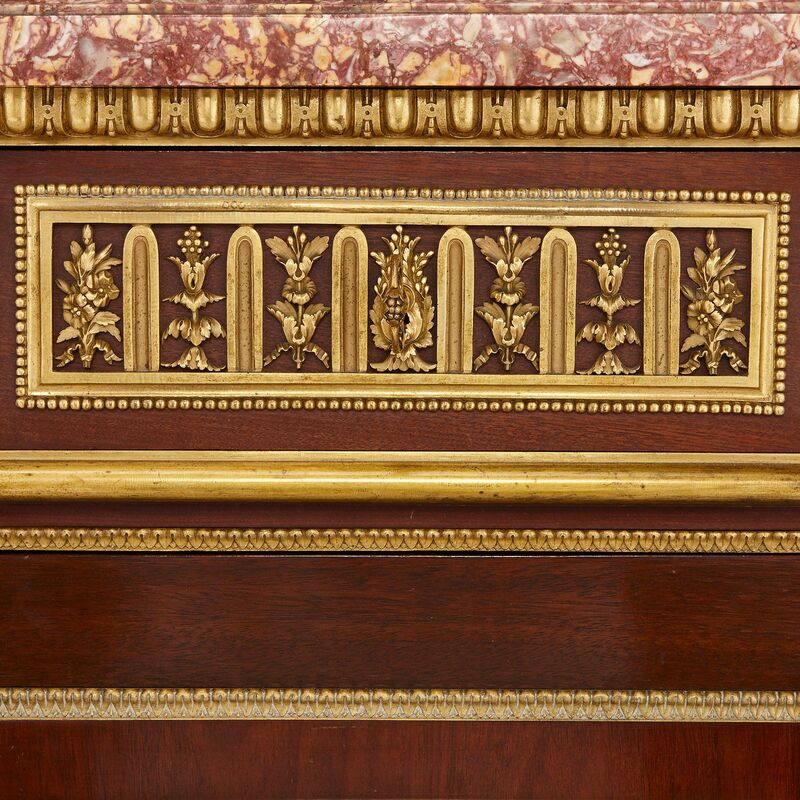 There are three drawers underneath the marble top, each with an ormolu frieze of scrolling foliage: the central drawer can be opened with a key, while the two drawers either side can be opened using a push button. 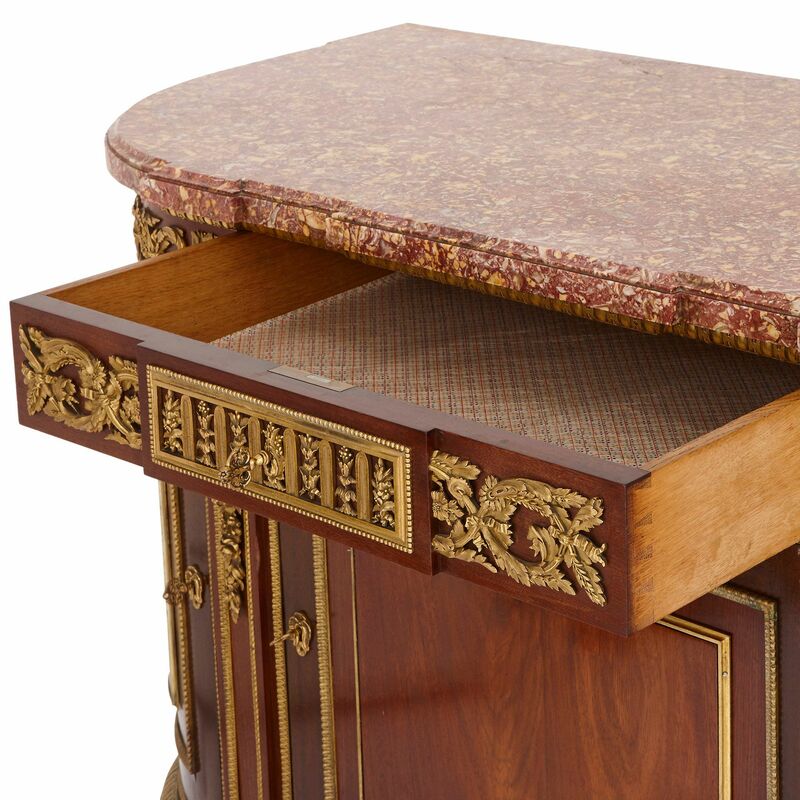 There are three cabinet doors below the drawers, and these open to reveal interiors with marble flooring and mirrored backs. 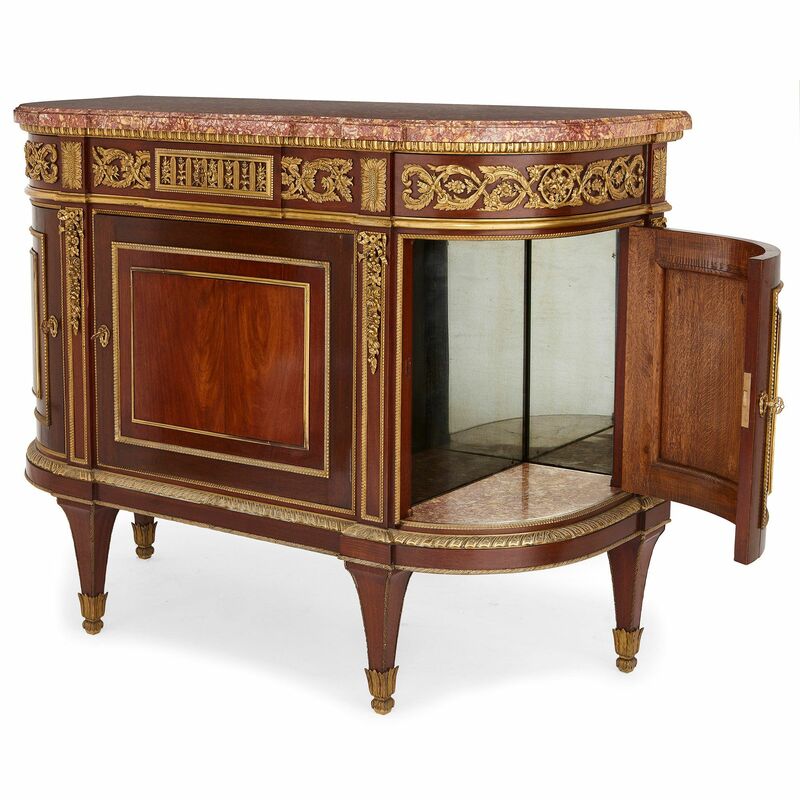 The central cupboard door opens to reveal one central glass shelf, making this piece an excellent storage solution as well as a beautiful decorative piece. 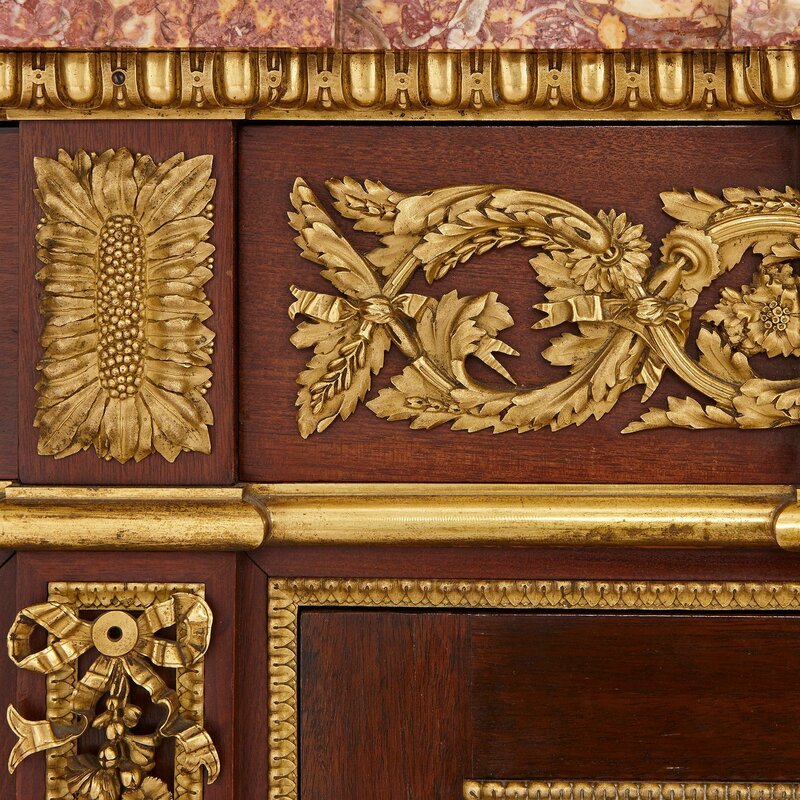 In between each of the doors there are ormolu mounts showing ribbons and hanging floral garlands, and the entire cabinet is set on four square shaped tapering legs. 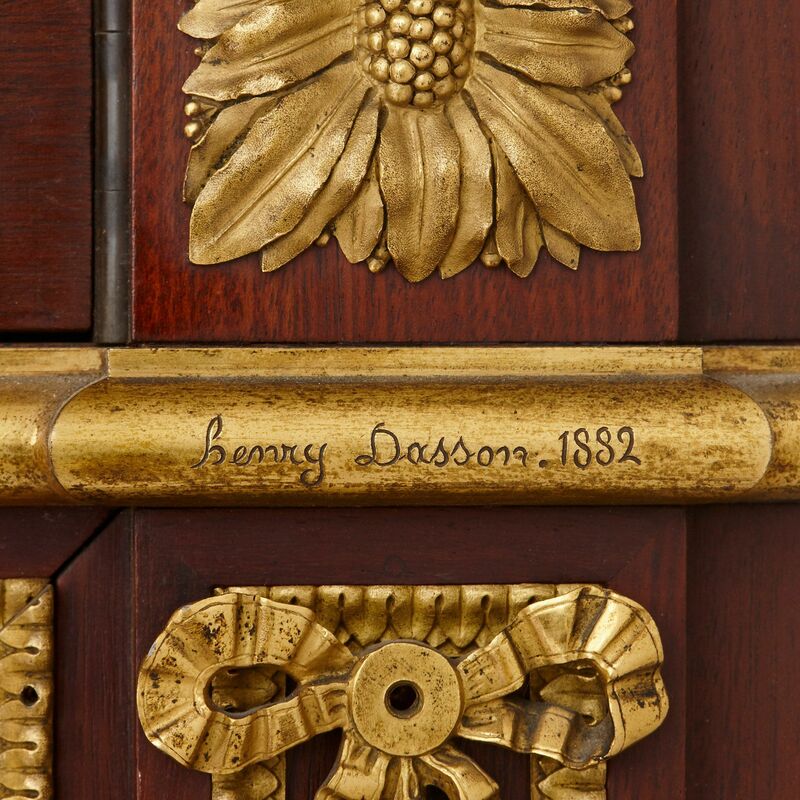 The cabinet is signed and dated on the ormolu 'Henry Dasson 1882' and stamped to the back 'Henry Dasson 1882'.